Sovereign William Hepburn 11yo (56.9%): Some distilleries in Scotland don't want to allow independent bottlers use their names on the labels. There are a few different reasons for that: Sometimes casks are traded or sold when they are at a very young age or even right after they are filled. In that case the distilleries don't have control on the quality of the final product and they don't want to risk their name to be associated with a low quality or faulty whisky at the end. Or they might have a distinct distillery profile they want to keep and they don't want to confuse their customers with different styles of whiskies with their name on it. Or sometimes distilleries want to get rid of some of their casks in their warehouses because the whisky in them are not showing promise to meet their standards or because they are simply casks from an experiment which didn't work quite well... Whatever the reason might be one of the most traditional methods used to prevent their names being printed on independent bottle labels is called "teaspooning". Before the cask leaves the distillery they add a fraction of another single malt into the cask to make sure that the whisky cannot be called single malt anymore when bottled. Even though most of the time we know where the cask is sourced from the rules do not allow the distillery's name to be used in any kind of marketing material after it has been teaspooned. So, that being said this "teaspooned" blended malt whisky I will be tasting tonight is distilled in March 2006 by a very famous Speyside distillery which is known widely with their Sherry Oak, Fine Oak and Double Oak range as well as Edition and Fine and Rare Series. 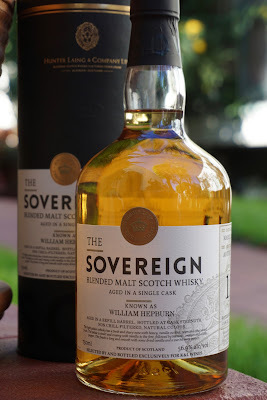 The cask which yielded only 190 bottles at the end is bottled by Hunter Laing under their Sovereign label exclusively for K&L Wine Merchants in August 2017 when it was 11 years old and named as William Hepburn. Color: Yellow gold, honey syrup with very slow moving and thick legs showing the famous oily character of the chubby and rather short stills of the distillery. Nose: We still have some minor sulphur issues here... Cheese rind, sliced fresh mushrooms and the smell of a freshly opened pineapple chunks can. Not distracting but they are there. After allowing it to air in the glass vanilla extract, pear compote and underripe plum aromas surface. Cream soda and lager beer. Adding water makes it even better. Now we have citrusy and floral aromas added. Mineral water, lemon juice and lemon frosting. Spearmint, fresh coriander and heather. Palate: Minimal cask influence and it tastes actually younger than its age. More like a Lowland malt or like old school Highland malts from 1980s. White pepper, vanilla and green malt. Tongue tingling and fizzy... Not a very layered whisky but it's kinda growing on me. Adding water helps on the palate as well. Peppery aromas are more tamed now... Cake batter, lemon cookie dough and more malt. A little ashy and chalky. Finish: Long with white pepper, vanilla and lemon rind. Overall: Still surprised... A month ago I was thinking that this whisky was faulty and never assumed that I might want to sip it again but here I am actually enjoying it in front of my TV tonight while I am watching DCI Banks... Still an odd cask, still not a dram to knock your socks off but at least all the pickled egg and struck match notes I remember from back when I first opened the bottle are disappeared into thin air. Quite an experience... I probably won't purchase another bottle but it was mind-blowing to observe how much whisky might change its course in a month after being opened.